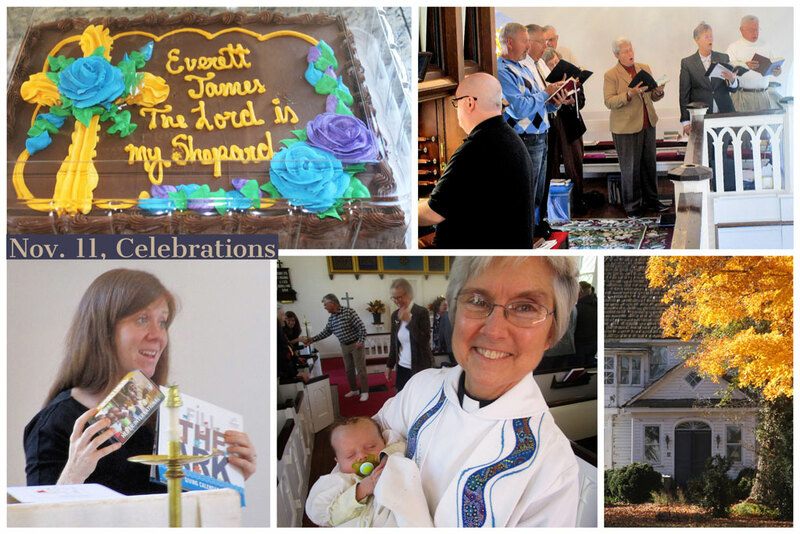 A diverse Sunday – A remembrance at the end of World War I, a baptism, the beginning of the Heifer Project. And a beautiful fall day with a bite in the air and leaves crunching under your feet. We had 49 on hand for this Sunday. We tolled our Meneely Bell bell and sang “God of our Fathers” at the beginning of the service as the war ended at 11am, on Nov 1918 exactly a 100 years earlier. The belfry was restored in 2010. The sermon was unique. “And today is all about being all in. So, with the help of your imaginations, I want to check in with several people who are all in.” During the sermon Catherine used props and dressed as the widow of Zarephath, scribes 2,000 year ago, the Widows Mite, her grandfather William Delbridge a veteran of World War I, and Don West founder of the Heifer Project. We had 23 in the Service at 4:30pm that was entitled an Evening Eucharist for children. It was both a service and snack supper. 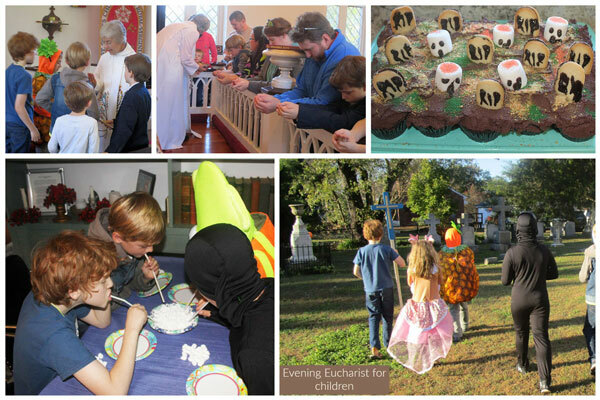 The service blended in Halloween themes and All Saints occurring this week. The children were dressed in costumes ranging from a princess, a pineapple, Dr. Who and even a skunk! The messages were All Saints. The service began in the front of the church talking about All Saints, who are the saints and then taking candles in jars to some of the graves. Then the service resumed in the church with a youth acolyte. The youth also read the Prayers of the People. The scriptures were well known – Psalm 23 and Matthew’s Gospel of Jesus walking on the water. The best time to view St. Peter’s is late afternoon on a clear day. This is apparent when we have evening services during Holy Week and at other times. The golden hour is from about 4pm to 7pm. Fall adds an additional dimension with vibrant sunshine, changing colors and a spirited wind. By 5pm the front of the church is glowing. 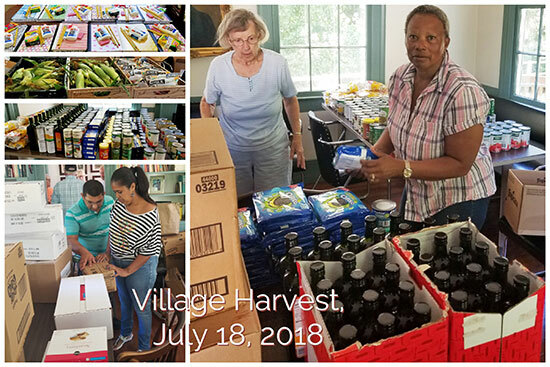 Catherine took these pictures during the Village Harvest distribution Oct 17, 2018. What is stunning is that the windows were reflecting the change of seasons. The great sycamore was in fine form with a deep color of green. Inside the church the light swirls and moves across the chancel, highlighting the door cross and/or altarpiece. 1. The Season of Creation as with last year focuses on God the Creator. God Creates the world God’s sustains the earth, promotes renewal for the entire creation, gives us the ability to take action where needed in the world. 2. The final creation was not at the beginning of Genesis and left as it was. The world is in constant creation. 3. As the Pope has said many times, “We are the guardians of Creation” and “everything is connected.” We must be the stewards of our earth and be on guard for its exploitation. 4. When we choose to live in God’s new creation, we grow, and contribute to the good of the world around us, loving one another. 5. 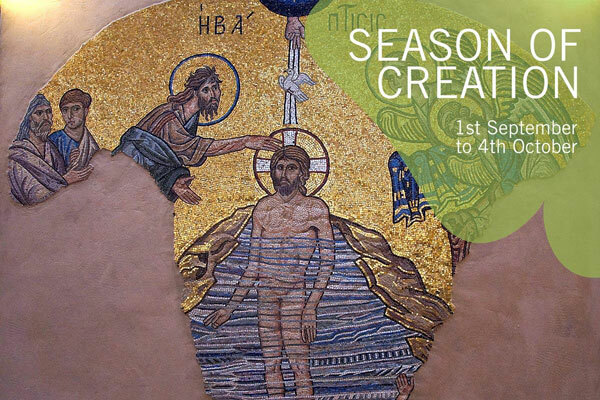 The Season of creation is about images and symbols to depict creation and our roles through scripture and the sermon. We used the sower, miracles, butterflies seeds, gardens, and mandalas to convey the meaning this year. 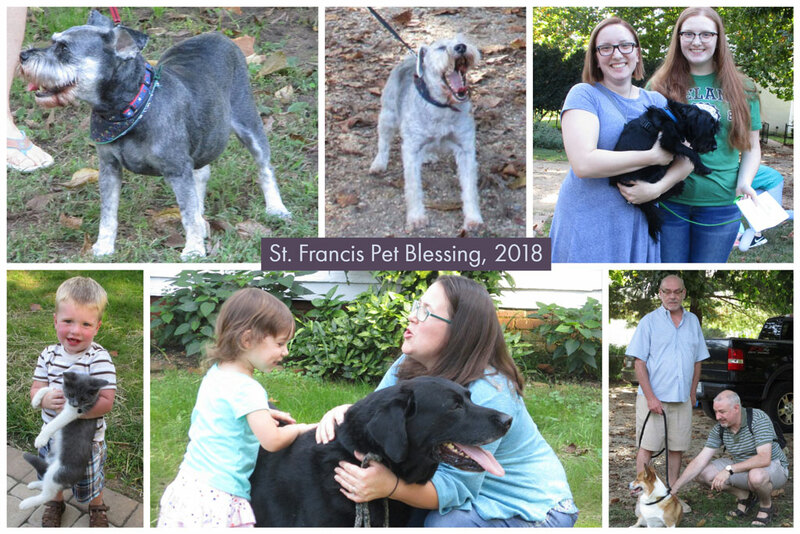 Under clear, but warm skies for an early October Thursday, Catherine blessed six dogs – Max, Opie, Bo, Rosie, Charlie, Koda, and one kitten–Cricket. It was a heated contest but Max and his owner came out with the $25 Pet Smart gift certificate. Elizabeth Heimbach’s mouse treats were delicious as usual and Catherine added “munchies” for all. Including Catherine there were 17 people. The location has varied over the years but the format is similar – singing favorite gospel hymns on various instruments with food either before or after. It has always been sometime in September just before the fall coolness arrives. 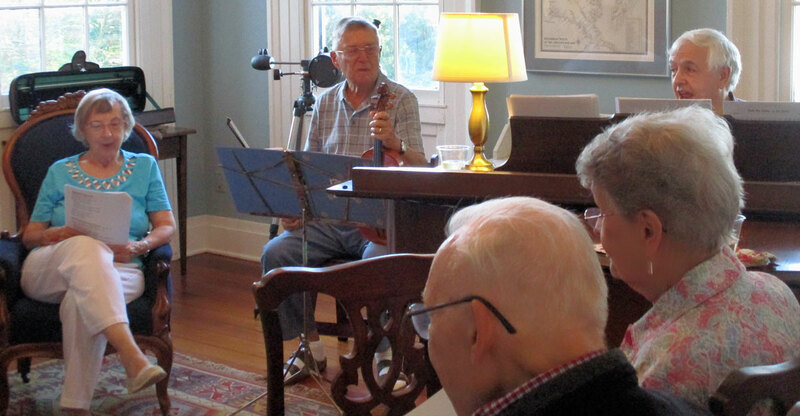 This year 17 participated with Jim Heimbach on the piano and Helmut on the violin with some vocals from Nancy. It has been in the church, besides the Parish House, in Portobago Bay but this year was the first time in a private home, the Heimbach home. 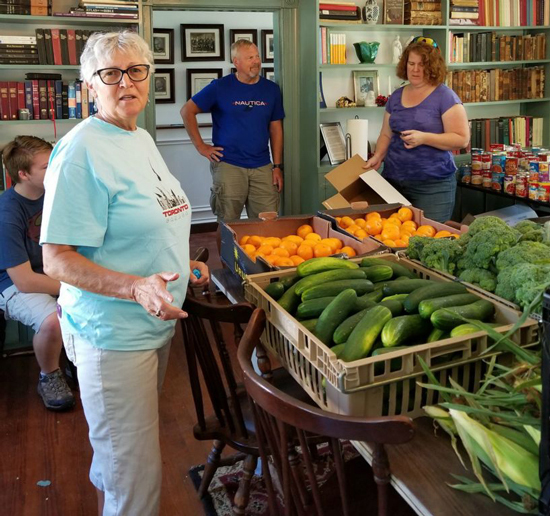 1,490 pounds of food were distributed which included a wide variety – 588 pounds of fresh produce, 463 pound of grocery items, 322 pounds of meat and 40 pounds of bakery items. While a significant number, it is under average this year’s average of 1,617 pounds. Still it is 121% greater than the same period a year ago. Parishioners are contributing school supplies this month and next. Thanks to Andrea Pogue for the photos. 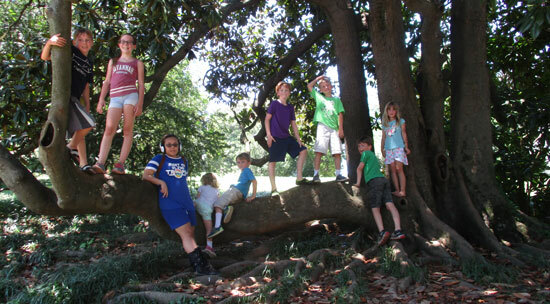 We had 14 youth and adults come along to the nature section of Maymont estate in Richmond on July 10, 2018. A midsummer treat! Everyone enjoyed running and playing on the well tended grounds. In the outdoor nature exhibit, we met owls, hawks, vultures, and two bald eagles. A small stream, the waterfall, the stepping stones were endlessly entertaining. Everyone enjoyed the farm, with its goats, sheep, chickens, pigs and a donkey. The goats and sheep licked food right out of our hands. 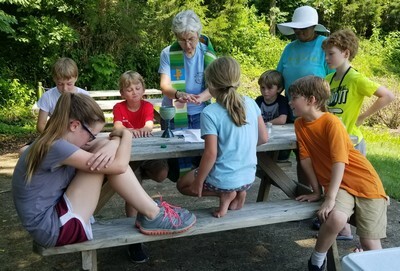 Back at the nature exhibit, we learned about the many creatures that inhabit the James River and other Virginia waterways. St. Peter’s was the scene of the Historic Port Royal July 4, observation. Many parishioners were involved. Cookie Davis, the President of Historic Port Royal opened the event and talked of her family roots. Nancy Long, Chair of the Caroline County Board, stressed the importance of participation and service in the collective role of government – we are the government. The men led by Johnny Davis served lunch and netted $600. Helping him were Helmut Linne von Berg, Charles McGuire, Ken and Andrea Pogue, Bill Wick, and Laura Carey. 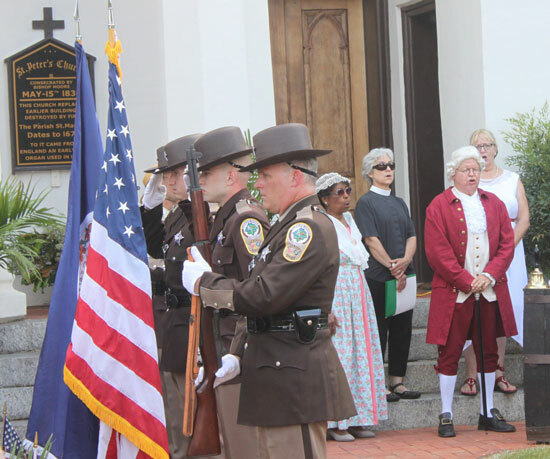 Mike Newman as the town crier gave an impassioned reading of the Declaration of Independence. The afternoon event included Marlyn Newman’s harp competition winners performing a mini-concert. Cleo Coleman (a good Baptist, though she occasionally visits us and participates in weekly ecumenical Bible study) provided an amazing historic recreation of Harriet Tubman in her later years in a nursing home recalling her life on a Maryland plantation and her role in the Underground Railroad. Nancy Long, Mike Newman, Thom Guthrie, pianist and Bill McCoy, organist (OK he is a Methodist) led the crowd in a patriot hymn fest. On a steamy hot day, Tuesday, June 19th, the St Peter’s kids, their parents, Odessa Davis, Dave Duke and Becky Fisher, along with Catherine Hicks and Andrea Pogue gathered to hike around Portobago Bay, to worship out in the beauty of God’s beautiful world, to greet the neighbors and to enjoy creation. After almost a year, our external sign has been restored by Rence Rupp from Fredericksburg. 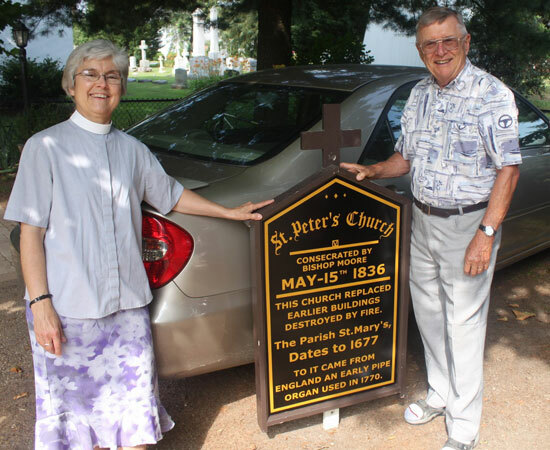 The sign was placed at St. Peter’s in 1936 as part of the 100th year anniversary celebration. It began a slow deterioration about 10 years ago. The original idea was to place the original sign under protection in our parish house and then craft a new sign. Then the idea emerged to trace the old sign in 2017. Bishop Shannon helped in this process. The church then shifted to restoring the old sign in 2017 which is now complete with the sign back in place, June 17, 2018. They feasted on baked tortellini, tossed salad, broccoli cauliflower, bread, cake and lemon lush for desert. (Brad contributed the cake). 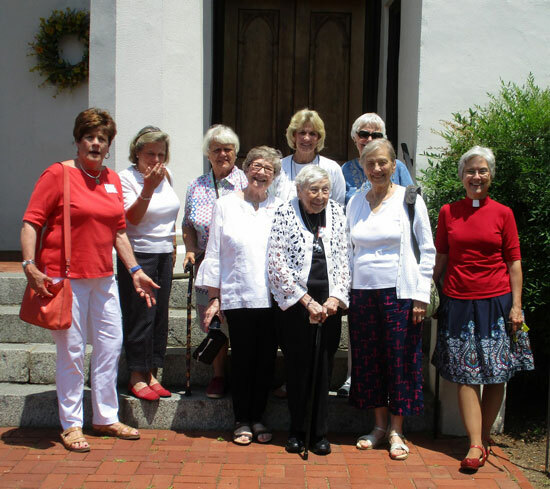 After lunch, they toured the church and posed for a picture on the steps of St. Peter’s. Thanks to all who helped! Kate gave out some of her famous eggs for a truly country event. 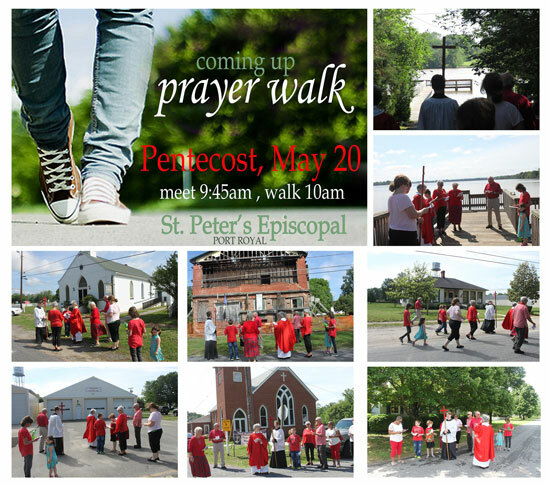 This is a successor to the 2017 walk which we did with Bishop Shannon. Last year we prayed with the Baptists, fishermen and other towns people. Above all we celebrated the beauty that we found. 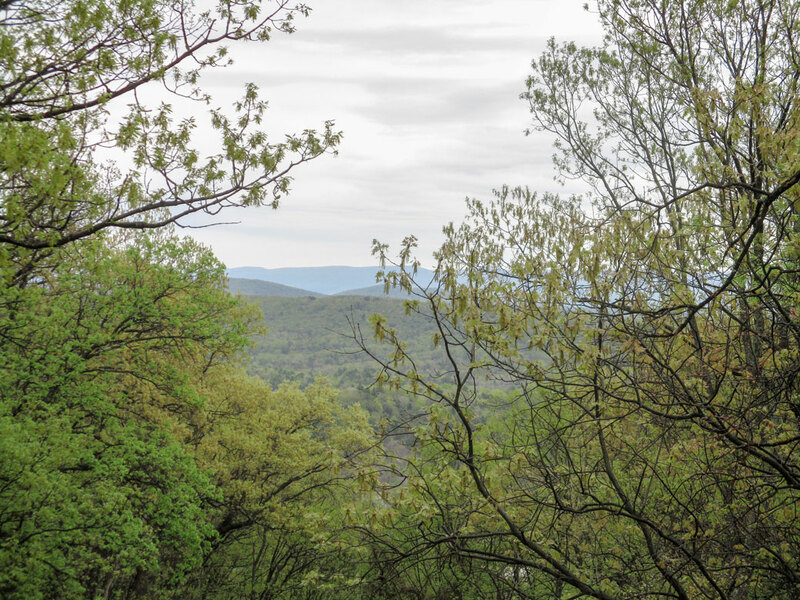 Pentecost is a time of renewal for Christian believers and nature is a perfect place for us to be. Through studying the story of Pentecost, many seek and pray for spiritual gifts for the church during this time of holy celebration. There is a renewed focus on evangelism, empowerment from the Holy Spirit, deeper intimacy with God, and fellowship. For Christians, the celebration of Pentecost imparts faith, hope, a sharing of community, and an awareness of a purpose much greater than ourselves. We are sent out in mission with a new energy.